Syrian Arab Army units on Monday were deployed in Zaizoun village and Tal Shihab town in Daraa province’s western countryside as part of the efforts to secure the towns and villages that joined reconciliations. 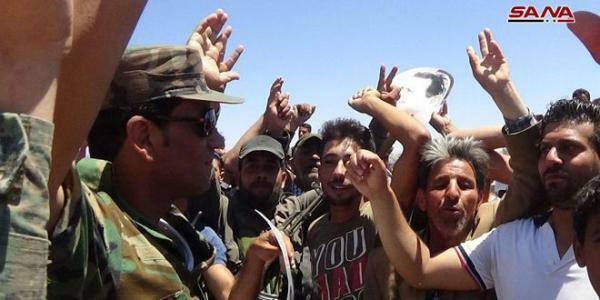 SANA’s war correspondent in Daraa said that army units were deployed in Zaizoun village and Tal Shihab town, which are located 20 km and 17 km southwest of Daraa city, respectively, and were met by a warm reception by the locals. The correspondent added that engineering units are demining the area and canvassing it for equipment left behind by terrorists. The correspondent said army units are being deployed in Daraa’s southwestern countryside to secure the area, particularly the borders with Jordan.